namic Mode, M Servotronic steering, body strengthening using special panels, lightweight compound high-performance braking system (optional M carbon-ceramic brakes), M double-spoke leather steering wheel, M gear selector and car set-up controls on the model-specific centre console, exclusive M sports seats with integrated belt system (optional M multifunction seats), Merino leather upholstery with extended features, exclusive carbon-fibre interior trim strips, illuminated door sill finishers with model lettering, M-specific instrument cluster with black-panel technology, 2-zone automatic climate control with extended features, ambient lighting; BMW Head-Up Display with M-specific information. M6 Coupe was unveiled in 2012 Geneva Motor Show, and later in Auto China 2012. 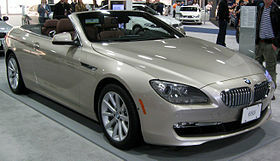 M6 Convertible was unveiled in 21st Auto Mobil International Leipzig 2012. The Gran Coupe is the fruition of the BMW CS Concept, a vehicle that was intended to slot at the top of BMW's lineup alongside the 7-Series flagship sedan. The CS Concept never made it to production due to the worsening economy in 2008, which also saw the retirement of BMW M development executive Gerhard Richter. Pricing for the BMW 640i Gran Coupe is slightly more than the BMW 740i. The Gran Coupe competes with the Audi A7 and Mercedes-Benz CLS-Class in the four-door executive coupe market. However, the Gran Coupe is larger and more expensive than the CLS and A7 and is priced close to the Porsche Panamera.